I love being able to step foot on the track each day knowing that I have the opportunity to follow my dreams. Your support means the world to me, and I also look forward to giving back to my community. For any high school track or cross country program, please contact me and I would love to share my experiences! 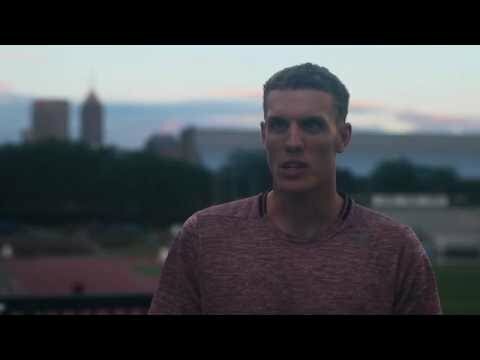 From small-town Indiana, Chris hails from Batesville, where, with a population of 6000, Chris devoloped into "this corn-fed, lanky looking, 400 sprinter." Though the town was small, Chris's sprinting was big time. While at Batesville High School, he was a state and midwest champion in 2011, and set the Indiana state record for the 400 meters, at 46.89, finishing his high school career with a top 10 rank nationally. All this while not training for his first love: basketball. Chris says, "My favorite sport is basketball. I wish I was professional in that, instead of track." Keeping with his roots, Chris stayed in Indiana to compete with the Fighting Irish of Notre Dame, and in 2015, earned a degree in Management Entrepreneurship. On the track, Chris was an 11-time All-American, DMR National Champion, and accumulated more conference championships than could be counted. Now continuing the dream after college, Chris has already found himself on the biggest stages, bringing home the World Championship in the 4x400m at the 2016 World Indoor Championships in Portland. Being unique both on and off the track is part of Chris's persona. He takes pride in his small-town upbringing, and is the shortest guy in his family...at 6'3"! Also, he sleeps with his eyes open, and has photo proof. Chris says, "On the track, I'm one of a few white 400 sprinters competitive at an elite level. I'm not your typical sprinter and I embrace the obvious differences in stature. People look at me and assume I'm either a high jumper or a distance runner. I want to show everyone that it doesn't matter what your background is, you can still be successful in whatever you want to do!"